This is the fourth and final in a 4-Part Series of reviews dedicated to exploring a single cigar size across each of the Cohiba brands offered by General Cigar. It’s been our pleasure to sample robustos from all four Cohiba lines. This extensive survey was made possible by Victoria McKee, Director of Public Relations at General Cigar Company. Featured this last time is the Cohiba Black Tubo Crystal, a robusto we received from General Cigar back in May of this year. 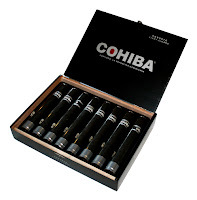 Produced at the General Cigar Dominicana factory, the Cohiba Black features one of the darkest looking wrappers we’ve seen, in crystal tubes, in boxes of 8. The current Cigar Aficionado rating for it is 86 (Aug, 2007). Following CA's 4-part rating system (Appearance & Construction, Flavor, Smoking Characteristics, and Overall Impression) seven of our club’s members took part in the tasting survey for this review. 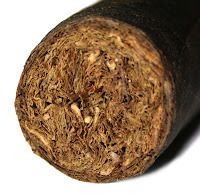 A few of these Black robustos did exhibit inconsistencies in roll quality, such as tight draw or the occasional soft spot found under the cigar’s wrapper. In fact, an overly-tight draw was attributed to five of our eight samples. Combustion faired a little better with only about half the cigars burning erratically. Fortunately, the quality of smoke was not grossly affected by the tight draws and the ash produced was actually somewhat impressive. The flavors were hard to pin down for some of our tasters, with several noting that distinction was difficult or that the notes were monochromatic at times. Some described it simply as: toasty, woody, peppery, or favorably “dark & rich”. Others found a bit more definition, such as spicy hot coco or tannic initially - mellowing to a smooth alder plank. Ultimately, this seemed to be a case in which a few of us really liked it, while the remainder were not quite there. For those among us, perhaps further study is the remedy we need. After throwing out the highest and lowest, then averaging the remaining scores, The Cohiba Club's official rating for the Cohiba Black Robusto is 86. An excellent cigar. Again, we should be reminded that ratings in the mid-to-upper eighties are not insignificant and that consumers should not rush to dismiss such scoring. It is our good fortune today, as cigar lovers, that there is such an abundance of high-earning cigars out there to choose from - thus enabling us to be so discriminating. 85 for the Cohiba Extra Vigoroso Robusto. 86 for the Cohiba Black Robusto. The standard Cohiba line has beat out its bretheren in tastings conducted by our club members. This is certainly not the outcome that many of us would have predicted. Of course, you don’t have to take our word for it. Next time you’re in your local B&M, pick up a bunch and conduct a brand tasting of your own. We are grateful to General Cigar for giving us the opportunity to conduct this tasting survey of all their Cohibas. We learned a lot about their cigars in the process and we urge you to do the same. Visit Cigar World to learn more about General Cigar’s product lines.